A leading figure with one of the greatest minds in contemporary semiotics, John Deely sadly passed away on 6 January 2017. Because he was a friend to so many and an inspiration to even more people who did not know him, we would like to offer you the opportunity to pay your tributes to this giant of both semiotics and philosophy. Please add your personal comments, below. La Revue DeSigniS, organe officiel de la Fédération Latino-américaine de Sémiotique, reçoit avec un profond regret la disparition soudaine de John Deely, ami et collègue de notre communauté de sémiologues. Il était un homme chaleureux, ouvert et á l écoute des différents tendances et domaines de la sémiotique contemporaine. Ses travaux en philosophie et sémiotique resteront des classiques pour la discipline. Nous le rendons un hommage sincère. It is a great loss for semiotics and also for phylosophy. John will continue to live for ever in his many contributions. Yes, it is really a great loss for all of us. He was a great semiotician and a great person. A Giant and an enormous inspiration! Such an influence! Development of the study of signs John gave us information galore. Writing knowledgeable works on signs nobody could have given more. 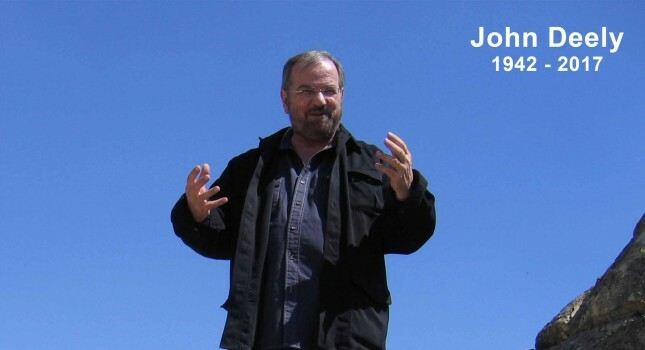 Wisdom he revealed, shining like a healthy vein of ore. John will be missed . . . but memories will prevail. Thanks John. This is such a sad news! I was hoping to meet him one day. When I first read his ‘The Impact of Semiotics on Philosophy’ I realized that was a different kind of profundity, one that I had not seen around for long. Rest in peace sir! John and I were friends and we argued constantly. But even when he was wrong, he influenced my thinking tremendously. Now he is with the other pioneers in semiotics. RIP. John Deely was a very good scholar. He was also very industrious; on several occasions he told me he was working on 6 or 7 books at a time. He was a good friend to many semioticians. An interesting detail in his biography: he had been a monk (I forget in which order) for 3 years during his youth. R.I.P., John! I’ll miss you in Kaunas and other semiotic events. He was with the Dominican order (never having taken final vows) at River Forest, Illinois. Dr. Deely was fond of paraphrasing Thomas Aquinas’ assertion that, if you want to make a great impact on those around you, teach; but if you want to make a great impact on the world, write. Having known him the past 7 years, teaching was certainly not his focus, but he nevertheless taught me quite a great deal. I was privileged to have written my doctoral dissertation under his direction. It may take some time, but I believe his writing will indeed have a great impact on the world: his knowledge of the history of philosophy and his insightful semiotic perspective will live on through his books, articles and all those who read them. He was a great scholar, philosopher, mentor, and friend, who should not be forgotten for as long as there are those who can read. I would like to express the great sorrow for the loss of John – a friend and a master. John loved to visit Bulgaria, since 2002 he has been at least 5 times. He often preferred to stay in my home rather than in a hotel. In 2005 he was awarded an honorary professorship at New Bulgarian University. The many discussions with John and especially the long argument that we had was a real baptism of fire for my semiotic carrier. I wish to participate and co-chair if necessary a session in Kaunas on Four Ages of Understanding – a book which I read under the close surveillance of John from cover to cover. what a pity! I was hoping to meet him this spring. When I first read his ‘Basics of Semiotics’ I realized that was a different kind of profundity, one that I had not seen around for long. Rest in peace sir! A dear colleague has left us before all of us have known him enough, at least from my part. Having read – late enough – one of the most important books for my life as a private researcher, “The Semiotic Animal”, I hoped since our last meeting to thank him for what is a short version of the “Four ages..” – that also helped me to really understand our semiotic self. Our friend Tom Sebeok always figured as the guard and garantor of the importance of semiotics, and it took years to appreciate the (even greater?) ability John Deely’s as a guide into the sublime semiosphere. apostle of postmodernity, you may prevail! The death of John Deely is a world wide loss for semiotics. He was a great scholar, combining medieval studies , philosophy, semiotiocs and culture theory. As a person he was rather dynamic, a dominant figure, and with true friendship. From 1990 on he became the only lifelong member of the Hungarian Association for Semiotic Studies. He participated at the Budapest symposium “Symbolicity”, orgtanized in honor of Thomas Sebeok’s 70th birtday. Deely was instrumental in poublishing the symposium papers, entitled “Symbolicity” (1993). We know each other for many years, and I think we were friends. With a kind memory of an old acquaintance, a great mind and human, whom I met first in 1994 and who then gave me a copy of his Basics of Semiotics, which I have kept in my immediate library ever since, wherever I’ve been. John, have your piece somewhere among the stars. I first met John Deely while working with Fr. Ralph Powell on the semiotic doctrine of John of St. Thomas (Jean Poinsot). Fr. Powell was his mentor (and mine as well) introducing both of us to the wisdom and genius of Poinsot. Dr. Deely had the advantage of having begun with Fr Powell two decades before I did, and thus being able to begin his retrieval of Poinsot’s work in the mid seventies. And magnificent work it was! But Deely was more than a Point scholar or even a medievalist (as I heard one envious speaker dismissively refer to him at a recent semiotic conference). His mind had wrestled with most of the philosophers of the modern age, and his monographic writings on St. Augustine, Decartes, Locke, Heidegger, Maritain, etc., can stand with the best scholarship on these thinkers. And beyond that, his masterful Four Ages of Understanding is unsurpassed as an account of the “way of signs” as the beating heart of intellectual history. Those who have learned from his writings and his example as a thinker, would do well to promote his work in their own research, writing, and teaching. Ohh… I just found it, now… and I can not yet realize that JOHN passed away. But, please believe me – I learned this from my own experience of life – and it is not a metaphor: JOHN STILL EXISTS. Just discovered John had passed away. Truly a great loss! His work was my introduction to the study of signs. He was also very kind to me, a total stranger, when our paths crossed many moons ago.